Free Wi-Fi networks found in public places such as coffee shops and hotels can be extremely dangerous for users and a paradise for cybercriminals. Sitting in a quiet and comfortable coffee shop with your laptop can be one of the best ways to spend your day. Because while there is no place like home, coffee shops can also make for a good place to work or just to chill out, drink some coffee, and browse the web. But there’s only one major problem with coffee shops: their public Wi-Fi network is high-risk, insecure, and vulnerable to data breaches and hacking attempts. How safe are public wi-fi hotspots? In short, not very much. While public wi-fi hotspots can be convenient and useful (especially when you’re on the go) they are not as secure as most people think they are. According to statistics, around 24.7% of Wi-Fi hotspots in the world aren’t protected with any encryption protocols such as WPA or WPA2. Which means that any novice hacker can easily intercept ongoing communications and collect personal data about users of said public network. I case your shopping online and logging into your personal social media accounts on public wifi. Hackers will be able to collect sensitive data about you such as your credit card information, passwords, personal photos, and more. Moreover, people have come to expect free Wi-Fi anywhere they go from coffee shops and restaurants to airports and even some airplanes nowadays offer in-flight Wi-Fi for free. And while these free public Wi-Fi hotspots can be convenient and are hard to resist especially when your 3G/4G runs out, they’re generally unsafe to use unless you want to risk having your identity and personal data sold or used against you. But what is more worrying is the fact that most users of these public networks are unaware of the security risks associated with public Wi-Fi usage. Not only that, but the very establishment that offered you free Wi-Fi could potentially be spying on your browsing history, collecting your data and selling it to third-party companies. The free Wi-Fi provider may also be asking you for personal information about yourself such as your name, email, or phone numbers and basically information that can be used for advertising purposes or to identify customers. Since you can’t really quit public Wi-Fi hotspots altogether, there are some things that you can do to protect your personal data from cybercriminals. 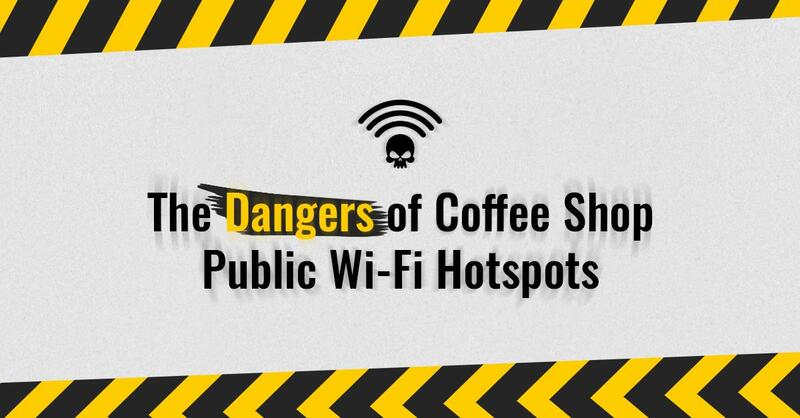 Coffee shops are also considered as the most dangerous place for public Wi-Fi according to cybersecurity experts. Mainly because many people rely on them for access to the internet on the go, as well as cybercriminals who see these public internet networks as an easy target for stealing people’s private data. Do not share your personal information: If you’re using a public wifi network, sharing sensitive information about yourself online or using your credit cards for shopping is very risky and could make you vulnerable to hacking attempts. Therefore, you should avoid sharing your private information online and only use the network for tasks that don’t require you to enter personal identifiable info to log in. Use your mobile data: investing in a 3G/4G data plan can save you from using insecure public Wi-Fi networks, not only that but your phone’s battery will thank you for this. Though this can be a little inconvenient when using a laptop device. Invest in a VPN software: In case you don’t want to consume your 3G data, and you would like to share information about yourself online, then you can use a virtual private network (VPN) to do this. A VPN app can be used to encrypt your internet traffic and hide your browsing activities from prying eyes or hackers on public WiFi. This way you won’t have to worry about hackers or anyone trying to steal your private data. As a result of the increasingly available public WiFi hotspots, everyone has become addicted to these free internet networks due to their convenience, popularity and low cost. But cybercriminals are taking notice of this too and are starting to target users of these public networks to steal their valuable data. Though you don’t have to quit using these free hotspots as you can use a reliable virtual private network such as VPN.Express to protect your data and hide your browsing activity while using these free WiFi hotspots.